2 comments | First published July 13, 2018 , last updated April 8, 2019 . Reading time: 5 minutes. Hair cutting shears are essential gear in every (home) hairdresser’s toolbox. Unfortunately, there are so many models out there it’s easy to get lost and make the wrong purchasing decision. 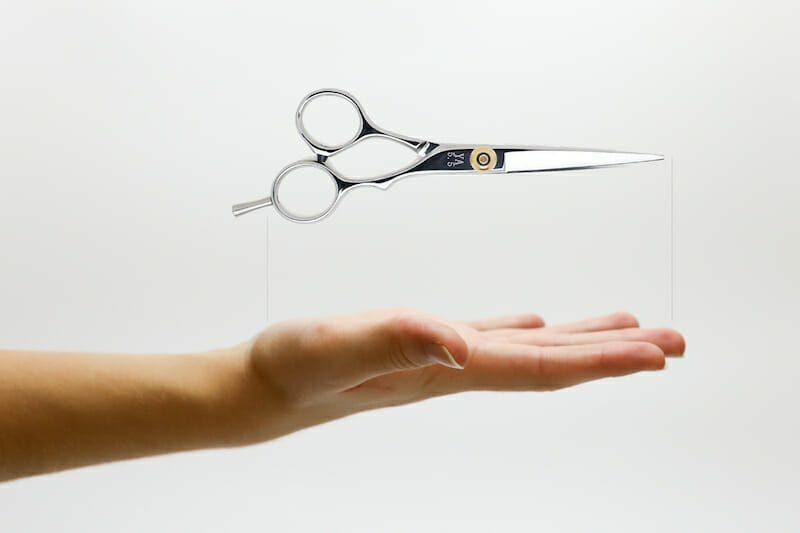 We decided to write this guide to shed some light on the market of hair cutting scissors, hoping to help you get exactly what you need, whether that’s professional or home use. As our criteria for this list, we mostly looked at the quality of these hair cutting shears. Scissors can always be sharpened if they get dull or oiled if they become rusty — as long as they stay in one piece! Always look at the length of the scissors. Shorter scissors between 4.5″ and 5.5″ are used for more detailed cuts while those above 6″ work better for more basic trims like your bangs. A good guideline is to measure your hand and get scissors that are the same length. Hair cutting shears have been evaluated based on users’ reviews. Read on to find the very best of hair cutting scissors for either home use or for professional use. Alternatively, if you’re looking for hair thinning scissors, click here. Let’s first go through our top picks for professional and home use. Our professional #1 pick is the Kamisori Typhoon. 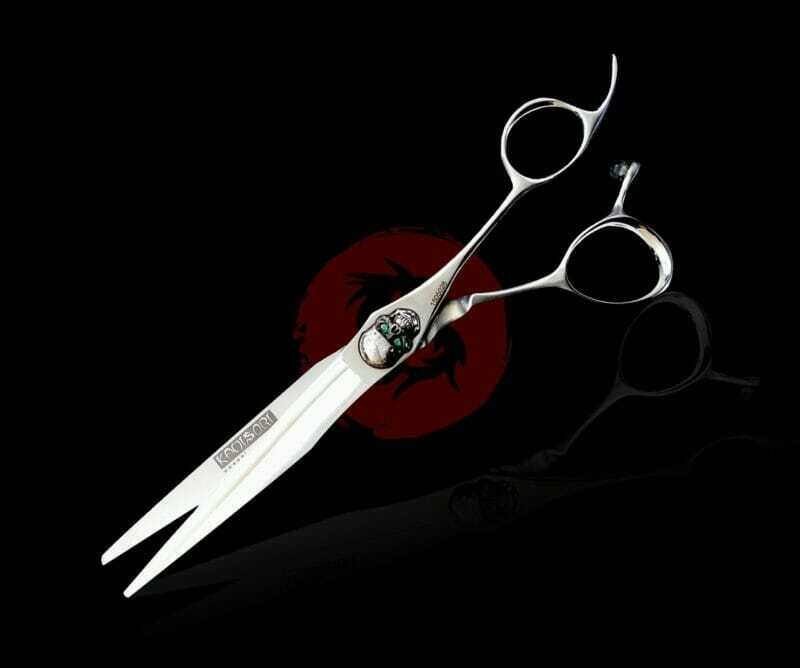 Kamisori is a well-trusted, award-winning Japanese brand of professional hair cutting scissors that come with a life time guarantee. The Typhoon offers a good balance between price and value. What sets these apart from your usual $100 professional pair is the company’s dedication to craftsmanship. Each pair is made by hand and goes through a series of 93 different careful steps to ensure the final result is nothing but perfection. If you’re looking to buy something that will last you a long time, this is what you want to go with. These are one of Amazon’s top-sold hair cutting scissors, with amazing rating of 4.5 stars and more than 1000 reviews. They are an upgrade from similar products from your local Walmart, you will notice a difference in sharpness and ease of cutting. Customers say that these give off a really good feel of quality for the price. If simple scissors to cut your fringe is all you need, definitely consider these. The price is one of the main benefits of these. Click here to check how much they cost. High quality paired with the brand well known by barbers from all over the world. This model has an semi offset handle and a length of 5.5″. Yasaka products are created using the Japanese Sword Smithing tradition, from 750 years ago that made the Japanese the most famous and sought after blade smiths in the world, making them one of the best japanese shears. These come in a complementary leather pouch. The Saki Katana Hair dressing scissors takes top rating from our consumers and that is why it is top on our list. It is made of quality Japanese 440C stainless steel. Its blade is the Japanese convex style that has 60-61HRC hardness. You don’t need to worry about adjusting the blades as they are adjustable. It would interest you to know that this shears were handmade! They are two piece welded with 1.5um of titanium coating. 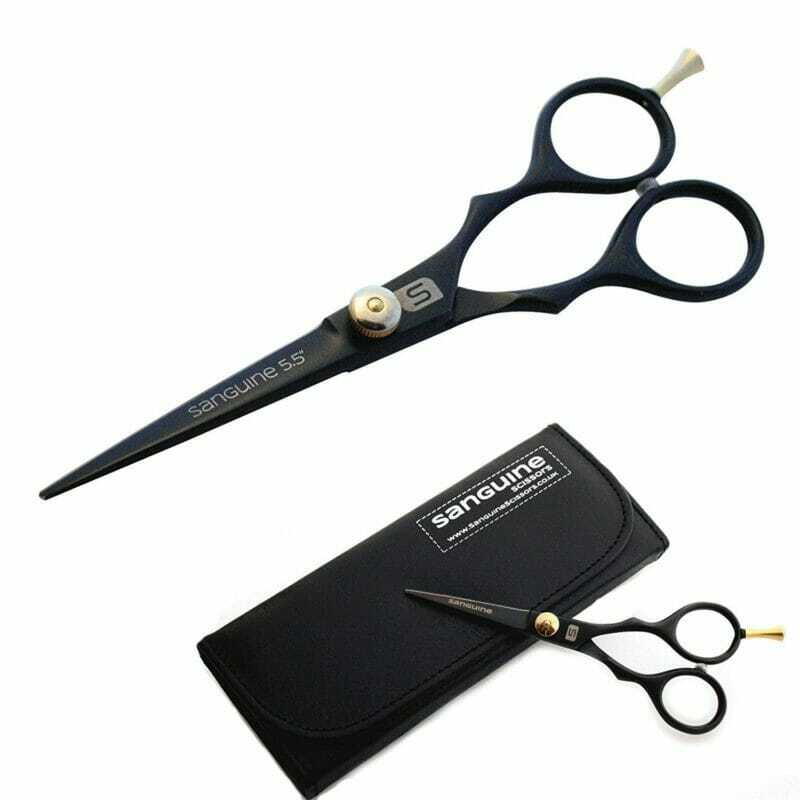 This is a professional hair scissors set that contains both regular and thinning scissors. This makes it perfect for someone who is just starting out! German-made scissors that hit the sweet spot between price and value, making it one of our top rated hair cutting shears. They promise long-lasting sharpness and the implementation of VARIO screw will make all adjustments to the pivoting part of the scissors a breeze. 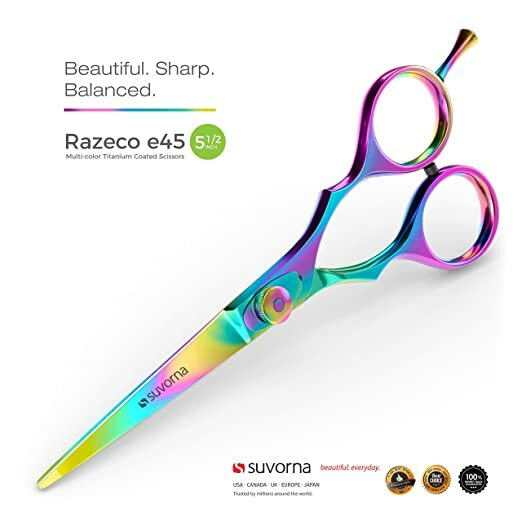 The Survona 5.5” professional shears is made up of Japanese 420 stainless steel. To make a great finish, the stainless steel is beautifully covered in rainbow titanium. The shears have rubber finger inserts that will make your grip more comfortable and are also removable to help fit in with any size of fingers. There is a knob that will help with adjustments when the tension in the blades is not as wanted. This scissors cost more than others but you can be sure it is value for money. You have beauty and performance in this type of scissors. Reviews rave about this scissors. They’re on Kamisori’s lower price end, but do not compromise on the amazing quality of the blades. These are perfect for basic to mid level professional cutting, and will retain sharpness for a longer time than the comparable, but cheaper alternatives. Diablo features a beautifully engraved handle and a sharp, convex edge. I absolutley love my Kamisori shears, it’s good to find website with reviews such as this one to help me if I ever need shears that don’t cost an arm and a leg!